I wonder if I'll have to hit her with the hammer once or two times, he thought in a visible balloon. And sometimes the young serial killers give themselves away by mixing up their inner and outer voices. This is actually the most sane person you've ever depicted. Still very funny. So that's the real reason so many comic book characters have stopped using thought bubbles! You know... I got nothin'. I mean, what do you say to or about a person like that? He does have a point. . . . Agreed. I'm picturing everyone here naked right now. Is it sad that I sometimes mentally apologize to any potential mind readers in the crowd for the thoughts of mine they may have just read? @Anonymous above me: No. No I do that all the time. 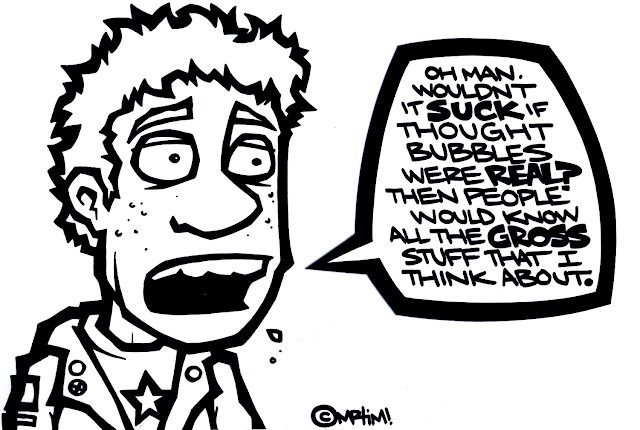 I actually have a short story where a guy can read minds, but he sees them in thought bubbles. There he is, sitting on park bench, watching people walk by with their thought bubbles gving away their true identities. @Anonymous 1:12PM - That's ok, luv. We forgive you. You gotta give the guy credit for being self-aware enough to realize that the stuff he thinks about is, in fact, really gross. Deadpool has this problem, and you can see how well it would work out for him if he weren't a comic book character. Now I'm wondering whether or not this customer will run across THIS particular comic, and how he'll react to it. Man, so our illustrious author, and all the people who agree with him, have never had a "gross", violent, or potentially-disturbing-in any-way thought? Wow. We've got a bunch of zen monks on this site, it seems. This kid has a point...we would all be in trouble, gross thoughts or otherwise. Yes, everyone has had a gross, violent, or disgusting thought. The joke is that the guy is worried about people being able to read his thoughts, but he's verbally articulating his thoughts. Why worry about people "seeing" your thoughts if you're saying aloud any stupid thing that comes into your head?